More good news as a call to Frank Grzeszczak at International Yacht Collection confirms that his joint central with David Nichols, the 39m Palmer Johnson motor yacht Mia Elise has been sold. Frank's colleague at IYC, Jim Eden, introduced the buyer. Launched in 2000 as Victory Lane, Mia Elise offers a full beam master stateroom with a walk-in closet, king size bed, desk, his/hers bathroom, and full entertainment centre. The VIP has a queen size berth, desk, en-suite bathroom, and full entertainment centre. There are two guest staterooms one with queen berth, one with twin berths, and both with marble bathrooms en-suite. 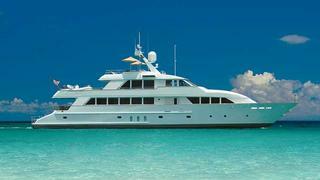 Mia Elise was on the market asking $8.995 million.